There’s a popular expression, “third time’s a charm.” When it comes to the iPhone, I would say the features on the latest 3GS include many that we have been longing for since the original iPhone days (EG copy and paste, MMS, video recording). When it comes to iPhone battery life, the 3GS performs better than the 3G but the original first gen iPhone still remains king. Internet over 3G tests were conducted over a 1900MHz 3G network using dedicated web and mail servers, browsing snapshot versions of 20 popular web pages, and receiving mail once an hour. All settings were default except: Call Forwarding was turned on; the Wi-Fi feature Ask to Join Networks and Auto-Brightness were turned off. Battery life depends on the cellular network, location, signal strength, 3G connectivity, feature configuration, usage, and many other factors. Obviously I didn’t go to the lengths of trying recreate the settings above. 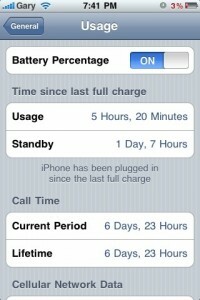 I wanted to see how my iPhone 3GS battery would fare under real life conditions. Leading up to my battery test I did a full charge cycle (charging to 100%, then running it down). After that, I did an full 11 hour charge on the phone (to include enough trickle charge) and proceeded to use it like I normally would. A grand total of 5 hours and 20 minutes usage (probably a few minutes more before it died on me) and 1 day, 7 hours of standby. If you recall my old iPhone 3G battery life test, I was able to get 6 hours and 4 minutes of usage, but only 22 hours and 20 minutes of standby. So it seems that my 3G outlasted my 3GS in usage, but the 3GS won in the standby category! What’s the Verdict? Which Battery Life is Better? iPhone 3GS or iPhone 3G or iPhone 2G? This is a complicated question to answer. The original iPhone had the best battery life out of all three iPhones, but at the same time there was no 3G connection and GPS to drain the battery. With the addition of 3G and GPS to the iPhone 3G, previous 2G owners were disappointed at the battery life. Now, given that the iPhone 3GS has a faster processor and more memory under the hood, being able to last the same amount of time as the iPhone 3G is pretty decent I’d say in my books. However, we’re also paying a premium to use the fastest iPhone right? Shouldn’t our battery life last even longer?! Some people might argue “my friends with Blackberries can have their phones go for DAYS without charging!” (solve this problem by getting new friends) Sure, that’s great but most Blackberries (sans the Storm, at 3.25″) have puny screens compared to the iPhone. Double that screen real estate and then we’ll see how much battery life you have left! As iPhone users, I think we tend to forget just how much more we use our phones with that large 3.5″ screen. Constant Safari, email, Twitter, YouTube, GPS, iPod, etc. would drain any battery on any device quickly. Another thing to keep in mind is that the iPhone 3GS would typically use more battery life anyways, given its processor/memory has been upgraded. Which would use more gas? A Honda Civic with a stock engine, or one with a modified turbocharged engine? Apple made the iPhone 3GS battery better than the 3G given the new internal specs. As for a battery life that accommodates the expectations of everybody out there, that is still up for debate. But compare the iPhone 3GS battery with other direct competitors out there (think Palm Pre) and I would say it’s pretty decent at the moment. Battery technology is evolving and we can expect more juice from all companies as time goes on. 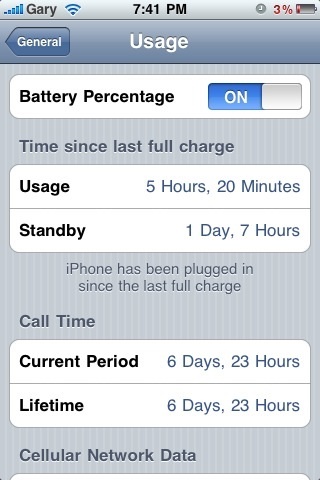 My iPhone 3GS was able to last me with almost a day and a half usage. I normally charge my iPhone every night, so I rarely run into battery issues. And if I do, I always have either a car charger or back up battery with me! You can still follow these tips on increasing your iPhone 3GS battery life. How long have you been able to use your iPhone 3GS battery for? Let’s hear it both your Usage/Standby times in the comments!